California is the latest state to lob legal challenges at the Education Secretary's controversial policies. WASHINGTON — Education Secretary Betsy DeVos is expected to take new steps as early as this week toward reversing Obama-era protections for students in debt to for-profit schools, including those that go out of business. It’s the latest in a broader effort by DeVos to recast the mission of her department and to relax safeguards intended to protect economically vulnerable students. DeVos is also expected to rewrite rules requiring for-profit schools to equip students with minimal employment skills to qualify for federal aid. DeVos’ plans to transform her department have gone largely unheralded, despite the outcry that greeted her appointment last year as President Donald Trump’s leading voice on education policy. But her push to ease regulations on for-profit colleges has opened a new front in the Democratic resistance effort, sparking lawsuits from state officials. California added another legal challenge Friday when the state sued the nation’s biggest loan company, Navient, arguing it had engaged in illegal conduct servicing federal student loans. Such challenges are a shot across the bow at the administration and DeVos, who is working to redefine a department conceived to advocate for students — not schools or lobbyists seeking financial profits. The debate carries huge significance for U.S. taxpayers, who fund the billions of dollars in student loans and grants DeVos oversees each year. “With Navient bulldozing students on their loans and the Department of Education gone missing in action, California is moving to stop the abuse,” California Attorney General Xavier Becerra told NBC News in a statement. The California suit argues that Navient improperly steered financially distressed borrowers — such as single moms and new graduates — into forbearance, costing them thousands of dollars. It specifically targets federal loans that DeVos and Mick Mulvaney, acting director of the Consumer Financial Protection Bureau, are tasked with policing. While Trump has touted a broad-based regulatory rollback since taking office, critics say what is about to happen at the Department of Education signals a retreat from its oversight role. And it comes as the president last week proposed to merge the Education and Labor Departments — another indication that the administration wants to scale back oversight. For-profit colleges came under scrutiny during the Obama administration for targeting low-income and minority students who borrow heavily to pay for them, only to earn often worthless degrees. These colleges overwhelmingly rely on students who take federal student loans and who tend to have a harder time repaying them. A DeVos spokeswoman dismissed the criticisms of it policies as politically motivated. California has been out front in challenging Trump administration policies, suing the federal government at least 36 times. Now the state is zeroing in on DeVos, a billionaire charter school advocate, and the changing mission of her department. In her 17 months on the job, DeVos has cut back the department’s sharing of information with the CFPB; brought into leadership of the department a number of individuals who’ve represented for-profit colleges; dismantled a team investigating widespread abuses by for-profit colleges; and at least temporarily reinstated a controversial accrediting agency sanctioned after rubber stamping now-bankrupt schools. With no experience in public education and a controversial record of charter school creation in her native Michigan, DeVos was a contentious nominee from the start. Her 2017 Senate confirmation process was so divisive that Vice President Mike Pence had to cast a historic tie-breaking vote for her to win Senate approval. Since then, DeVos has largely escaped the scrutiny directed at other Trump cabinet members, like HUD Secretary Ben Carson’s costly office furniture purchases and EPA Director Scott Pruitt’s various conflicts of interest and heavy spending on security and travel. DeVos’ regulatory rollback agenda on for-profit colleges could draw her back into the limelight. Hill also said DeVos was obligated to reinstate the controversial accreditor because of a federal court order. But the judge in that case never said the accreditor should be reinstated, and an internal document showed department staff advised against doing so. Most for-profit colleges’ revenues — with billions of dollars at stake — come out of the federal budget via Pell Grants and other student aid. Historically, these schools have been responsible for the large majority of federal fraud complaints, given their record of aggressively recruiting lower income female and minority students who tend to take out higher levels of debt while earning degrees at a lower rate. A 2012 Senate Democratic report offered a window into accusations of predatory behavior the Obama administration was trying to stop. Following the Obama administration’s crackdown, for profits’ share of federal student aid dollars has dropped. In 2010, the schools consumed $32 billion, or 25 percent of total programs; in 2017, it had dropped to 13.7 percent, or $16.6 billion. “It could open the doors to another resurgence of for profits, a whole reliving of history in terms of waste, fraud and abuse in the for-profit sector and a massive abuse of taxpayer dollars,” said Clare McCann, a former senior policy adviser at the department under President Barack Obama. “It’s all happening in slow motion,” said McCann, now at New America, an education policy think tank. 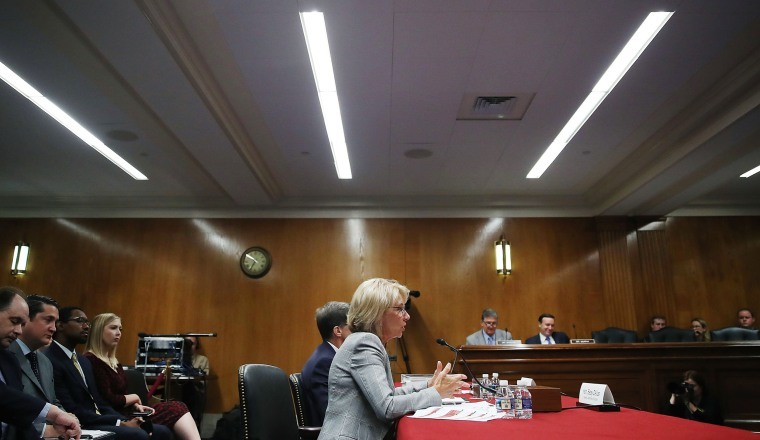 Administration allies on Capitol Hill say for-profit colleges have an important role to play in a transitioning economy and job market, pointing to rising demands for non-traditional and vocational training. The solution, they argue, is demanding greater transparency from the schools including information about their job placement rates, not regulation. Yet according to a report by the Education Department’s own inspector general, DeVos in her first six months ordered a virtual hold on claims for debt forgiveness from students who say their schools defrauded them. When the department resumed processing the claims, it granted significantly less relief to students. Trump as a New York businessman operated a for-profit school, Trump University. Earlier this year, a federal court awarded a $25 million settlement to students who said they were duped by Trump into taking expensive seminars. The for-profit college industry’s reach into the department is significant. Among DeVos’ closest advisers is senior counselor Robert Eitel, a former vice president at two for-profit college operators. For two months, as the department made decisions affecting for-profits, Eitel remained employed by Bridgepoint Education, a for-profit where he was an attorney for regulatory legal services. Straddling both roles, Eitel worked on rewriting the so-called borrower defense to repayment regulations that make it easier for students to file for debt relief that was beneficial to his employer. In September 2016, Bridgepoint settled with the CFPB for $23.5 million for allegedly deceiving students. Two months before Eitel was hired, Bridgepoint was fined $300,000 by the Education Department for miscalculating federal financial aid refunds. Hill defended Eitel’s position, nothing he had a 27-year legal career that included serving as deputy general counsel at the department under President George W. Bush. He only worked at Bridgepoint for one and a half years, Hill said. Eitel is “operating completely within his ethics agreement,” she said, adding that he had taken an unpaid leave of absence from Bridgepoint and recused himself from working on any existing claims. After meeting with the department’s ethics officer, Eitel was cleared to work on future regulatory actions, she said. Emails obtained by NBC News offer another illustration of the more favorable approach DeVos is taking to for-profit colleges. They show representatives for the Charlotte School of Law, a now-defunct for-profit law school that had been placed on probation by the American Bar Association, lobbying DeVos aides to reinstate its access to federal loans. While the Obama administration in late 2016 had choked off funding to the school, DeVos officials invited the school to reapply for Title IV federal funds. In one March 2017 email, the representative, Dennis Cariello, even offered to fly the law school’s general counsel to Washington to make his case. Eventually the school shut down, but only because the state of North Carolina pursued its own investigation. Meanwhile, two other schools owned by the same company, InfiLaw Corp., continue to operate in Arizona and Florida, even though their Arizona school is also on probation by the ABA. Hill said DeVos’ department has put the school on a monitoring list. “Compliance and oversight is part of the daily work” at the department, Hill said, “When we do take enforcement action we don’t feel the need to score points in the press.” She cited 57 enforcement actions in 2017, a five point increase from 2016. Later this month, the administration is expected to take a step closer to undoing borrower defense rules that protect student loan borrowers in cases where colleges defrauded students. DeVos has argued that that students have been refunded too casually. “All one had to do was raise his or her hands to be entitled to so-called free money,” DeVos said last September when she began taking aim at the rule. One Capitol Hill aide close to the process said DeVos may not completely roll back protections, but rather require students to make their case individually instead of as part of a group. Student advocates also warn of a potentially major rollback later this year in oversight of online schools. “This opening of the floodgates. I don’t even know how to express how serious it is,” said Jennifer Wang, director of the Washington office of the Institute for College Access and Success. “We should all be very concerned for students and taxpayers that all of this is happening."